It all started out in the usual way -- we had some extra money, enough to take the kind of trip I'd dreamed of since I was a little girl. I ran it by my loving husband (during some sort of sporting event on TV, for maximum understanding). I got the nod and smile I needed. We were going on our first Disney Cruise! I was extremely excited and began planning right away. 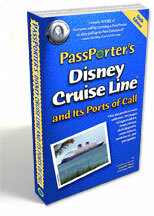 Two PassPorter guidebooks were ordered, one for the land and one for the sea portion of the vacation. Every second of extra time was spent poring over message boards and web sites. I had important decisions to make -- did we want to swim with dolphins? Eat dinner at Palo? Have a luxurious massage at the spa? I think she said something about Disney again. Did she say cruise? Wait. Cruises are expensive. We've got a front yard to put in, a house to paint, and three kids to put through college someday. We can't afford a cruise. What's the score? The planning continued and payments were made (and days added to the land portion). It was time to do some shopping! Everyone needed new clothes, swimsuits, and other vacation items. This was another fun part of preparing for the cruise. We'd have the opportunity to wear fancy clothes and swimsuit cover-ups. Sounds like a dream come true to me! I'm going to have to dress up to eat dinner? I thought this was a vacation. Why do we need all this stuff? Isn't this vacation expensive enough already? Am I really going to enjoy this? What am I going to do on the ship while you're doing "Disney Stuff?" The travel and the Walt Disney World portion of the trip went off without a hitch and before we knew it, we were being whisked off to Port Canaveral in our luxurious Disney bus. I couldn't believe how seamless this trip was. No luggage worries, no arguing over a map of a completely strange city, and no worries about entertaining the kids. How relaxing, and we're not even on the ship yet! Walt Disney World was fun, but I'm ready to go home. So far so good, though. No schlepping suitcases, no driving or navigation responsibilities, no whining kids. This ain't so bad! Within minutes of embarking on our voyage, we were fed and relaxing with frosty drink in hand. The kids were busy doing things that made them happy, and the husband and I were left to our own devices. There were lovely long dinners, chats at the ship's rail overlooking the vast ocean, and some beautiful sunsets. There were movies with no interruptions, and even a couple's spa treatment. We really reconnected on this family vacation. My wife is so relaxed and happy, and we can spend time doing what we want to do. We ate ice cream in bed and watched movies that weren't animated or rated "G." I've been in a golf chipping contest and hung out in a sports bar. I can eat whatever I want, whenever I want. Surprisingly, I liked the spa as much as my wife did. Oh, yeah, and the kids are having a good time, too. In addition to the very romantic aspects of this vacation, we had some wonderful family moments as well. We built an extraordinary sandcastle, hunted for treasure on a tropical island, and indulged in lots of giggling and adventure-sharing each evening before drifting off to the gentle rocking of the ship. All too soon the journey was coming to an end. We'd be heading back to reality, but not before having the time of our lives together. I hope we can someday embark on a Disney Cruise again. The service was superb from the moment we stepped on board to receiving our airline boarding passes and being relieved of our luggage when disembarking the vessel. It was the perfect vacation for each person in our family and for all of us together. We'll definitely be saving up for another Disney Cruise. It's the best vacation I've ever been on. My family and I were treated like royalty. Every detail was taken care of so we could truly relax. Next time we're staying longer, though. It was the perfect vacation for each person in our family and for all of us together. So if you have a doubting Thomas (or Rob or Sally or whomever) in your family who thinks a Disney Cruise is too expensive, too fancy, or just not their idea of fun, try to get them to think again. And most importantly, get them on the ship! The patented Disney Magic (or Wonder) will do the rest. About the Author: Rebecca has been an avid Disneyland fan as long as she can remember. She's recently added Disney Cruise Line and Walt Disney World to her list of favorite places on the planet. When not traveling, planning to travel, or visiting Disney, she is mother of three, wife of one, and teacher of 23 third graders.